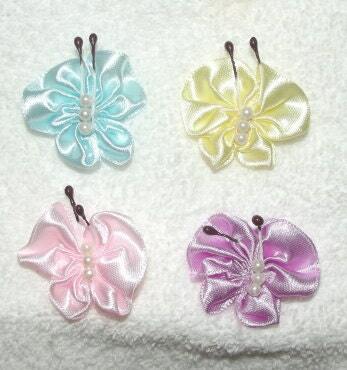 Set of 4 sweet spring butterflies in the colors shown of baby yellow, baby blue, baby pink and lilac. Measure about 1 1/2" and each has a 30mm barrette on the back. Mark 8:36 "For what shall it profit a man to gain the whole world and lose his own soul." A percentage of all orders is used to create Operation Christmas Child shoe boxes. Won't you help us today with a small purchase?